Him: Hon, who is Thirty One? Him: Because they authorized for a penny on our bank account. Me: Oh, cuz the party's not over. Him: What do they sell? Me: The CUTEST bags and totes and you can personalize them!! Him: You don't have enough bags? Me: I only have one with a squirrel on it and this one is going to have MISS SQUIRREL embroidered on it!! Him: Did you get me anything? Maybe I need a new bag. Me: What would you put on your bag? Him: "THE MR." What else??? so it just might be a surprise!!! going on until the 15th! There are some really cute prizes that you can enter to win, too! WE DIDN'T NEED KID MENUS!! but I am ANTI SHAKER for the rest of my forever!!! ask for some of those packets from McDs! It was decided last night that they are not broken. Did a DR tell me this? Was I examined by a professional? He said that I would have "gone through the roof"
There was no way I could have "gone through the roof"
PASSING OUT ON THE FLOOR!!! Best Actress in "I Can't Stand Up and Cook because My Toes Are Broken"
"I know this will be a weird question- but how did I get here?" You crack me up! Believe it or not, my Mr. has a personalized tote! It was a gift years ago (not from me), and has just our last name on it. He's a teacher/coach, so it's for papers. I'll text you a picture--I think it looks manly but I'll let you be the judge! Hahahaha! Good luck with that conversation! Luckily none of mine have asked me that one yet! Ah...I remember those days of "How did I get here." When I started to answer, the kiddos didn't really want to know. UNTIL, my SIL got pregnant. I survived...barely! I once had a broken toe. Holy moly...who would think an itty bitty toe could be so painful! And I felt like I rebroke it several times! Ouch! 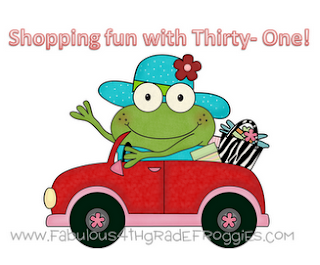 I love Thirty One but don't have any yet! Can you believe that? I'll have to rectify that situation soon! After your last post, I'm with you on giving up the shakers for good. Glad you got out to a place with no kiddie menus. Ahaha! I DREAD the day I get asked that by my future children. Do tell us what you said! Gotta love that birds and bees convo...we've gone into it minimally with my 10 year old. He hushed me after I said the "v" word...guess he wasn't quite ready. I'm glad your piggies are feeling better! I love Thirty-One Bags! I have way too many of them and, of course, both my sister and sister-in-law had to go and have parties within the past month. Well, I could not show favoritism, so I had to purchase some from both. Let's just say, I think I could be a Thirty-One Consultant now. I just about have enough bags to cover an entire party! I guess the only bad part of my presentation is that they are all in the same print (Yes, I am OCD and I like everything to match). I love me some The Mr. I think he should have come out with you because he and Tony sound like they came from the same school of not broken toes. Hilarious post! Glad your piggies aren't broken. Good Luck with "the talk"
Oh Lordy! You crack me up! Good luck with the "conversation"! Good luck with that question! Glad your piggies are better Staci :) And yes, you should definitely get The Mr. a t-shirt with "The Mr." on it. hilarious thanks for a good laugh and sorry to hear about the toes... ouch!!! If you're looking for a good contextual advertising company, I recommend that you take a peek at ExoClick.